In the previous article (http://ponnadi.blogspot.in/2012/08/srivaishnava-lakshanam-11.html) we observed the dhinacharya of a srivaishnava. they were fully focussed in bhagavad vishayam - no where in their lives it is recorded that they were after money, fame, etc. Even if there are some seemingly conflicting episodes, those are there to really highlight the greatness of a particular acharya or srivaishnava in the end. In fact as soon as they gained this valuable knowledge from their acharyas, they immediately gave up every comfort they had and simply served their acharyas. even though most of them were married, they did it only for lOka kshEmam - i.e., to create sath santhaanam to protect and nourish our sampradhaayam. Though all of our pUrvaachaaryas were like that a few like koorathaazhwaan, Embaar, pillai lOkaachaaryar, azhagiya manavaala perumaal naayanaar, Ponnadikkaal jeeyar (prime disciple of Manavaala maamunigal), etc were indeed special due to their total detachment from any vihitha bhOgam at all. But even beyond all of that, there was manavaala maamunigal who manifested all the qualities that were identified in srivachana bhUshana divya saastram. Let us see how we can make such a bold statement that maamunigal fully manifested the vaishnava adhikaarithva pUrthi. We will understand that by going through the meaning of the following paasuram and by going through mamunigal's life history. Maamunigal says "Who will understand the inner/deep meanings in srivachana bhUshanam? Who will live by those meanings? Even to find one such person is difficult because these are very difficult principles to follow for any one". Even though he says we cant find even one person, we have to understand that there are only few persons (a very small percentage of the total srivaishnava population) who will be able to do this. Just going by the commentary of Pillai lOkam jeeyar for this paasura vyaakyaanam, he clearly says that "Only Manavala maamunigal who was clearly blessed by pillai lOkaachaaryar can understand and follow these principles stated in srivachana bhUshanam". sUtram 455 - vihitha bhOgam Nishidhdha bhOgam pOlE lOka viruththamumanRu, Naraka hEthuvumanRu; aayirukkachcheythE svarUpa viruththamumaay, vEdhaaNtha viruththamumaay, chishtakarhithamumaay, praapya prathipaNthakamumaay irukkaiyaalE thyaajyam (விஹித போகம் நிஷித்த போகம் போலே லோக விருத்தமுமன்று, நரக ஹேதுவுமன்று; ஆயிருக்கச்செய்தே ஸ்வரூப விருத்தமுமாய், வேதாந்த விருத்தமுமாய், சிஷ்டகர்ஹிதமுமாய், ப்ராப்ய ப்ரதிபந்தகமுமாய் இருக்கையாலே த்யாஜ்யம்). Simple translation: Even though sense enjoyment coming out of married life (as defined by saastram - even for this there are many rules on how/when this should be done) is accepted by saastram and it is not going to lead one to narakam, etc., but since it is said to be aathma svarUpa virOdham (any bodily enjoyment is to be given up) and since our pUrvaachaaryas never focussed on that and since it is a virOdhi for the ultimate goal, it is to be given up. Based on his life history, we can see how Manavala maamunigal was an epitome of these qualities. Let us see this from some of the salient points from his life. Maamunigal being an avathaaram of Emperumaanaar himself, showed us how we should totally be surrendered to emperumaanaar by constantly thinking about emperumaanaar, worshipping him at the bhavishyadhaachaaryan sannidhi in azhwar thirunagari, writing yathiraaja vimsathi, aarthi prabhandham, etc. Manavaala maamunigal accepted Thiruvaaimozhi pillai as his acharya and stood by his acharya's orders throughout his life. He learnt srI bhaashyam once but spent his whole life on arulicheyal and its meanings. He was an unparallel scholar in sanskrit and vedhaantham but he always explained vedhaantham through arulicheyal only. In his dhinacharya done by Erumbiappaa, it is said that "Maamunigal's lips were always chanting dvaya mahaamantram and his heart is always thinking about thiruvaaimozhi". Once when his mutt was set fire by some miscreants in azhwarthirunagari, he asked the king to forgive the miscreants and showed his mercy towards even those who saw him as enemies. When Uththama nambi commited an offense to Maamunigal, he silently walked out - he did not say a word to uththama nambi. But periya perumAL then shows to uththama nambi that he was none other than aadhi sEshan himself. When he heard that some of his sishyas are not respecting other acharyas in srirangam, he stopped his kaalakshEpam and asked his sishyas to first respect other acharyas before listening from him. When once some farmers submitted some raw materials, maamunigal finding out that those farmers are not vaishnavas, promptly returned the food. He was so carefully avoiding avaishnava relationship. When once an old lady wanted to stay in his mutt for a night, maamunigal strictly says that it will not be acceptable. Such was his standards when it comes vairaagyam. Prathivaadhi bayankaram annan who was a great scholar when came to meet Maamunigal, maamunigal was giving a lecture on Thiruvaaimozhi. Looking at maamunigal's total command in vedhaantham and arulicheyal and pUrvaachaarya vyaakyaanams, annan was spell bound and he immediately became maaunigal's sishya. Many acharya purushas from srirangam accepted maamunigal as their acharya even though they were already born in acharya purusha families. Maamunigal spent his whole life searching for all pUrvaachaarya vyaakyaanams, documenting them, memorizing them and teaching them to all his sishyas. Even at a very old age he use to write in palm leaves for the benefit of others. His honesty was unparallel which got him the title - poy illaatha manNavaaLa maamuni (பொய் இல்லாத மணவாள மாமுனி). His command over saastram and language were unparallel which got him the title visadha vaak sigaamaNi. His commentaries to rahasya granthams are of extraordinary quality - without those commentaries it will be impossible to understand the inner meanings. Without his prachaaram (propagation) of thiruvaaimozhi it would have been impossible to understand the essence of thiruvaaimozhi. He never criticises any pUrvaachaaryas - even if there are contradictory statements in any grantham - he simply states them as is, instead of putting down any one. He was so humble that he did not approve of any festivities for his archa vigraham in both srirangam and azhwaarthirunagari (avathaara sthalam) to keep the focus on namperumaaL and nammaazhwaar respectively. He allowed very small archaa thirumEni to be made and ensured that there is hardly any purappaadu (procession) for his thirumEnis. Amidst all of these, emperumaan (namperumaaL) who was not satisfied with his previous acharyas (vasishta/vishwaamithra in ramaavathaaram, saandIpani in krishnaavathaaram, etc) found Maamunigal to be the perfect teacher. It was his divine wish/plan to even have the same name as his acharyan (both named Azhagiya manavaalan). So he ordered Maamunigal to give a lecture on Eedu vyaakyaanam of Nampillai for a whole year in front of his aasthaanam (sannidhi) in thiruvarangam. Namperumaal ordered all the utsavams to be stopped and he along with his divine consorts (sridhEvi and bhUdhEvi) heard Maamunigal's lecture for the whole year every day. On Aani Thirumoolam day, on the occassion of saatrumurai (final day) of the upanyaasam series, NamperumaaL took the form of a small boy named aranganaayakam, came in front of maamunigal and presented the following thanian (as a sishya would do for an acharya). Here, emperumaan says "I worship azhagiya manavaala maamuni who a) is the holder of the mercy of Thiruvaaimozhipillai, b) is an ocean of jnaanam, bhakthi, vairaagyam,etc and c) has boundless love for emperumaanaar". He ordered that this thanian is chanted in all divyadhEsam temples, other divya kshethrams, mutts and thirumaaligais during the beginning and ending of arulicheyal anusandhaanam.This can be observed even today, wherever we go we hear the glories of maamunigal during arulicheyal anusandhaanam. He also offered his sEsha paryankam to maamunigal as acharya samarpanai (even today we can practically see only Maamunigal as the only acharya having sEsha paryankam in his archaa vigrahams). 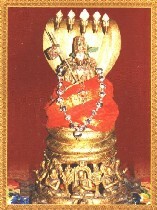 he (until today) continues to perform maamunigal's thiruvadhyayana mahOtsavam (since it is the sishya's duty to perform the thIrtha utsavam for his acharyan) in thiruvarangam. 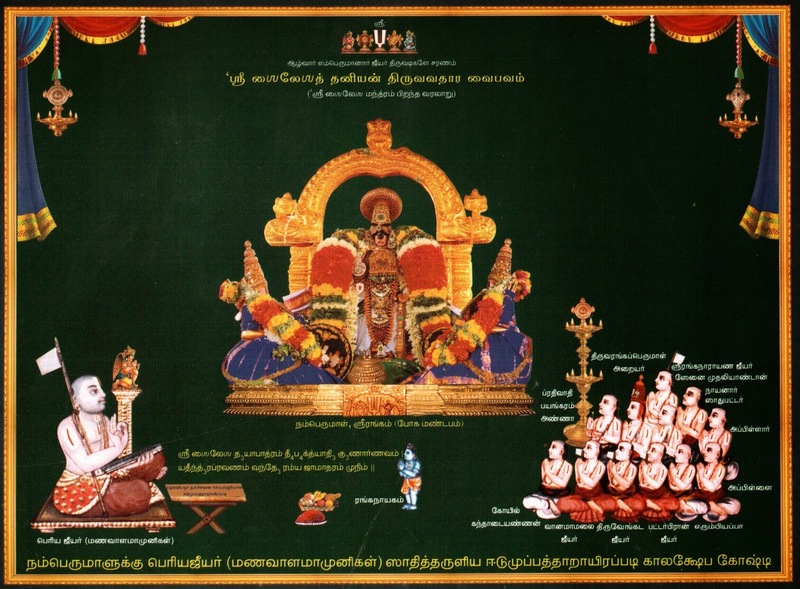 On this day (maasi krishna paksha dvaadhasi), periya perumaaL's archakas, paricharakas, etc will come with periya perumaaL's paraphernelia (kudai, chaamaram, vattil, etc) and perform the utsavam at srirangam manavaala maamunigal sannidhi. Emperumaan also does not consume bhOgya vasthus like surulamuthu (beatle leaves/nuts), etc on that day showing respect to his acharya. So, we can understand that from our pUrvaachaarya's lives none of these principles are theoretical. We can see for ourselves that they have lived their lives with great dignity, honesty and maturity. They have also documented these for the benefits of the future generation to understand and follow. It is purely emperumaan's causeless mercy that we are some how born as humans, that too in a srivaishnava family, that too with some intelligence to understand and appreciate this wealth of knowledge from our pUrvaachaaryas. We should be ever grateful to emperumaan to have presented such opportunity to us and we should immediately take up to his desires and engage ourselves in serving him and his adiyaars. This series is coming to a conclusion now. In the next (concluding) article adiyen will summarize what was discussed so far and end the series.